Kristan Higgins is a delightfully reliable author. Whenever I pick up one of her novels, I know that I’ll find a heroine I could be friends with, a hero I’d pick for her and a wonderful floppy dog that I wish I could cuddle with. The happily ever after will give me all the feels and I’ll sigh deeply before reaching for the next one. Even the ones she doesn’t knock fully out of the park are still solid triple plays. All I Ever Wanted is good Higgins – not great, but good. Set in Georgebury, Vermont, our heroine is Callie, an advertising executive who is desperate for her happy ever after. She’s even had her rocking chair for that happily ever after, just waiting for the groom. After her current fling and boss fails to produce the ring by the creeping deadline of the 30th birthday, she turns her attention to the only other viable option – the new guy in town. Our hero is Ian McFarland, the new local veterinarian. A bit gruff, perhaps even stand offish, Ian is not quite sure what to make of Callie. However, he gets caught up in her whimsy and they find each other in her happily ever after chair at the end of the book. Like I said, this book is not Higgins’s best work, but it’s still miles above a lot of the other contemporary toff that’s out there. If you’re looking for a delightful few hours of a trip to a lovely small town with colorful characters and a sweet romance, pick up All I Ever Wanted and enjoy it with a fresh, fizzy Diet Coke. 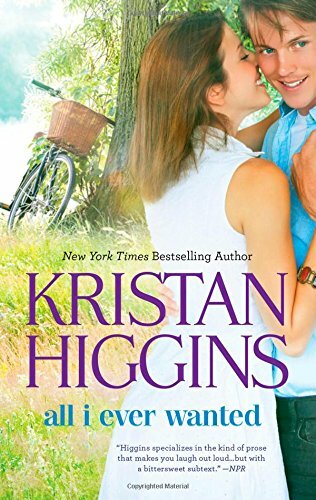 Kristan Higgins’s Amazon Page: If Higgins’s brand of romance crack is up your street, look no further than this page. Custom Made Rocking Chairs: If you’d like a happily ever after chair of your very own, check out this page. Vermont Vacations: If the setting of the book seems idyllic and on your list, book your next vacation to Vermont! Animals, Contemporary, Diet Coke, Romance, Small Town, U.S.